Council President Donald Tusk’s trip to the South Caucasus has largely focused on the ‘frozen conflicts’ in Nagorno-Karabakh, Abkhazia and South Ossetia. Between 20 and 22 July, Tusk visited Armenia, Georgia and Azerbaijan, which are part of the EU’s Eastern partnership initiative. Georgia has signed an Association Agreement and wants to become an EU member. Armenia gave up EU association and opted for the Russia-led Eurasian union. Gas-rich Azerbaijan is developing energy ties with the Union, and is seeking a partnership with regular bilateral summits of the type Australia and South Korea have with Brussels. But all three countries are scarred by post-Soviet conflicts. In the case of Georgia, the brief war the former government, under Mikheil Saakashvili, started with Russia in August 2008, resulted in two of the country’s regions, South Ossetia and Abkhazia, declaring independence and coming under Moscow’s control. A week ago, Russia moved a section of the border of South Ossetia further into Georgian territory, bringing a section of the Baku-Supsa oil pipeline under Russian control. “The recent installation of new demarcation signposts is a clear provocation and does not contribute to building trust and advancing ongoing efforts to stabilize the situation,” Tusk stated in Tbilisi. The European Council President said he had assured the Prime Minister Irakli Garibashvili that the EU remains committed to conflict resolution and supports Georgia’s territorial integrity within its internationally recognized borders. “The so-called “Treaties” signed recently between Russia and Abkhazia and South Ossetia, violate Georgia’s sovereignty and territorial integrity. They contradict the principles of international law, as well as Russia’s international commitments”, Tusk stated. In Armenia, Tusk expressed concern over the recent negative trends around Nagorno-Karabakh, and urged dialogue at the highest level between the Armenian President Serzh Sargsyan and his Azeri counterpart Ilham Aliyev. There have been new reports of sporadic clashes between Armenia and Azerbaijan, fuelling fears of a wider conflict . Azerbaijan and Armenia have no diplomatic relations, as Armenia-backed separatists occupying Nagorno-Karabakh, officially territory of Azerbaijan. The dispute is rooted in a bloody war in the early 1990s, following the breakup of the USSR. Yerevan-backed ethnic Armenian separatists seized control of Nagorno-Karabakh and several other regions of Azerbaijan during the conflict, which left some 30,000 dead. Disputes over wording on Nagorno-Karabakh had threatened to prevent the summit of the Eastern partnership in Riga last May from agreeing to a final document. Tusk is reported to have at one point called Azerbaijani President Ilham Aliyev to smooth things over. Azebaijan says Nagorno-Karabakh is illegally occupied by Armenia, and calls the country an aggressor. Conversely, Yerevan claims that it has no effective control over this territory and that it has never been part of an independent Azerbaijan. A recent decision by the Council of Europe’s European Court of Human Rights concerning the complaints of seven Azerbaijani nationals who were unable to return or receive compensation for their property in Lachin, in Nagorno-Karabakh, confirmed that Armenia controls the territory. But another body of the Council of Europe adopted a resolution which was seen by Baku as “anti-Azeri”. Its text stated that “the assembly is aware of the Nagorno-Karabakh conflict” instead of original wording that said “the assembly is aware of the occupation of Azerbaijani territories”. Armenia is also pushing for the self-determination and independence of Nagorno Karabakh. However, the conflict has generated 600,000 internally displaced persons from the region to Azerbaijan, but their return has not been part of such plans. Moreover, reports speak of the resettlement of Syrian Armenians in Nagorno-Karabakh. Armenian President Serzh Sargsyan took advantage of Tusk’s visit to call for self-determination. “No matter how hard Azerbaijan tries to distort the essence of the Karabakh problem, the right of the people of Nagorno Karabakh to decide their future by free expression of will has not been disputed for a long time. Moreover, this is said in statements of the OSCE Minsk Group Co-chairs. In the context of that idea, we are prepared to proceed along a path of reasonable compromises,” Sargsyan said during a joint press conference with Tusk. 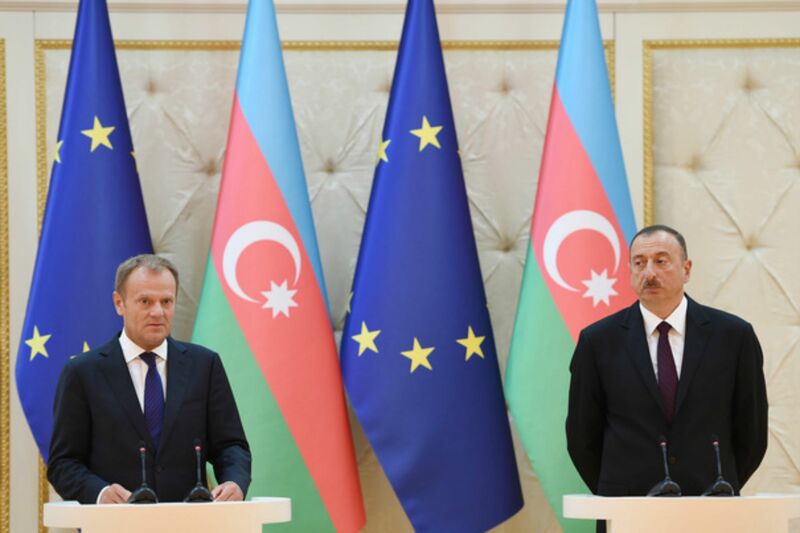 In Baku, Tusk made it clear that the EU has no plans to recognise Nagorno-Karabakh. “The EU supports the territorial integrity, independence and sovereignty of Azerbaijan. The EU and its member states have not recognised Nagorno-Karabakh,” Tusk said. The Council President also made reference to the human rights situation in Azerbaijan. Various European bodies and human rights groups have accused Aliyev of muzzling dissent and jailing opponents, charges Baku denies. “The EU believes that an open society is the best guarantee of long term stability and prosperity. I have discussed with the President our concerns with the detention of human rights defenders here and our hope that prompt action will be taken on the individual cases. We will continue to discuss these issues and to explore ways for good and mutually beneficial cooperation on human rights, also in the context of the future of our contractual relations”, Tusk said. Last Monday, Reuters reported that Aliyev hit back at Western critics, including a resolution by the Germany’s lower house of parliament, the Bundestag, which accused the mainly Muslim country of restricting religious freedom and discriminating against its non-Muslim citizens. The resolution also says the overall human rights situation in Azerbaijan has declined markedly since a 2013 presidential election and urges the German government to continue pushing for the swift and unconditional release of all political prisoners. “Is the German Bundestag master of the world, ruler of the world, should everyone obey them? … We don’t want anything from them, while they, on the contrary, need our gas, contracts, oil and our activity in this region,” Aliyev reportedly said.